The airwaves and blogosphere are crowded with stories of people who have lost their jobs in this brutal economy. This is important— recessions impact real people, and it is essential that we hear the stories. "After a long period of chasing work (which is a job in and of itself), I am back in meetings. I am back to waiting for others to do their part so that I can start, continue and/or finish my part. I am back to sitting in meetings where others discuss topics that are not directly relevant to what I am doing, but are interconnected with my tasks. I am back to getting on airplanes, figuring out how to spend my time in the air. 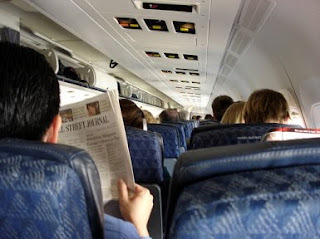 I am trying to drink hot coffee and work on my computer during a bumpy ride - everything balanced on the little white fold-down tray that sags to the left a little (I keep thinking that if I can build enough miles, I may someday be able to sit toward the front of the plane). All of those things have been tiresome in the past. They likely will be tiresome again some day . . . but not right now. It's nice to have challenges again that have an invoice and a pay check connected with them." It is easier to feel gratitude when something of value has been returned; harder to be grateful when you never lost it. Perhaps those of us who have not lost our jobs might join my friend in his gratitude today. Faith, hope, love... nothing seems possible, but all prove real. Stories rooted personal tragedies invite us, the audience, to similarly wrestle with our faith in God, given the reality of sickness, evil, and death. There is the occasional Christian-themed narrative where the telling is exceptional – the stories of C.S. Lewis and Flannery O’Connor and the movies Chariots of Fire and Lord of the Rings come to mind. But these are rare. More typical are the “Christian” movies and novels that never rise to the level of compelling art. They are sincere, but forgettable. Occasionally, however, we encounter that story which remains artistically flawed, but nevertheless proves compelling to its audience. This summer we became fans of two such “flawed” stories – the novel The Shack by William P. (Paul) Young and the movie Henry Poole is Here, directed by Mark Pellington. The Shack is a fable written by a deeply wounded Christian. Paul (William P.) Young said he wrote the story to share his spiritual healing with his six teenage and young adult children. He does so by telling the story of a middle aged man named Mack who after living through an unimaginable tragedy and having a “Great Sadness” descend over him, is summoned to a shack in the wilderness. There, where “everything awful has been hidden away,” he encounters the Trinity. They are living in loving domesticity – a large African-American woman named Papa, a middle aged Middle Easterner with a big nose named Jesus, and a small, Asian woman named Sarayu (Sanskrit for ‘air,’ or ‘wind’). After the first one hundred pages that tells of the tragedy, the tone of the book radically changes. There is little action narrated; rather, we are given the conversation at the shack over a weekend between Mack and this nontraditional depiction of the Godhead. Mack’s anger and disillusionment is allowed voice, his pain brought to the surface, his faith examined and reshaped, and his life transformed. Some, wanting to turn parable into proposition have questioned the orthodoxy of Young’s story. How can all three persons of the Godhead be given bodies? Isn’t Young too critical of the organized church and too open to having God be present outside the Christian community? But many others, ourselves included, have been moved by the honesty and creativity of this novel. Self-published at first, The Shack has sold over one million copies and has lit up the internet chat rooms. Any Christian theology is ultimately only as good as its understanding of God – given the reality of sin, evil and tragedy. And Young’s folk theology has clearly struck a chord by centering right at this conjunction. Not all of his metaphors will work for you (at least they didn’t for us), but many will, and some will move you deeply depending on your life circumstance. This is not a book to dissect with a scalpel, but to allow your imagination to be pricked and your understanding, broadened. The movie Henry Poole is Here (2008) tells the story of Henry (Luke Wilson) who has retreated into a shell after learning that he is dying. Returning to the neighborhood of his childhood, he tries to buy his old family home but must settle instead for a run down, empty house near-by. Again it is in a “shack” that Henry’s “theology” will be challenged. Wanting simply to drink his way to oblivion, he is distracted by his neighbors. Millie, a six year old who lives with her mom Dawn, has been totally silent since her dad deserted them over a year ago. She tapes Henry as he talks to himself, and then plays it back across the fence on her recorder. Esperanza, the busybody neighbor on the other side, discovers that the new stucco patch on Henry’s house has a stain that looks like the face of Christ, and despite Henry’s protestations, brings others to touch and be touched by this “miracle.” One of these is Patience, Henry’s grocery store clerk who after touching the wall no longer needs her bottle rim glasses. Another is Millie, who begins to speak again. Henry keeps saying, it’s just a water stain. It’s not a miracle, just an accident. He wants to shrivel up and die. But such reasoning is to no avail; solitude proves impossible, for “miracles” seem to be happening. As Henry struggles to remain the skeptic amidst a growing group of believers, and as his friendship with Dawn blossoms, he discovers the importance both of love and of hope. Is the “stain” a picture of Jesus? Does Henry have faith? It doesn’t seem so. But miracles have happened. “Faith, hope and love” infuse this small movie, and the greatest of these is love. Like The Shack, there is little to no action in Henry Poole. The pace of the story telling is slow, and the script is at times hackneyed. But the movie is nonetheless infectious, both because of the winsome presence of Henry’s neighbors and because of the power of both music and image to help us connect. (Mark Pellington, the director, is an award-winning music video director.) We are drawn into the lives of Henry’s neighbors. In their quirkiness and caring, they come to matter, not only to Henry but to us. They are open to receive a miracle. In the process, we too become more open. Pellington says he shot this movie because its story and themes “said” what he wanted to say to the world, given the sudden death of his own wife, which left him to care for their toddler daughter alone. Wanting to crawl into a hole, he could not. What do you do when you question everything, when you’re not sure where you’ve been? Faith, hope, love – miracle? Nothing seems possible, but all prove real. If theology is always a conversation between faith and life, between God’s Story and our stories, then Christian theology in the 21st century will also reflect the present context of our lives. In a world where pain, ambiguity and evil are all too often present, it is the “folk theologies” of Young and Pellington, though perhaps barefoot, that now speak with fresh power and insight. Here are “stories with intent,” to borrow a phrase from our good friend Klyne Snodgrass. If we have eyes to see and ears to hear, these modern day parables can help us glimpse the face of Jesus. Our Guest bloggers: Rob Johnston and Cathy Barsotti are long time friends of Lumunos who wrote the movie review for the Faith at Work/Lumunos magazine for several years. Cathy Barsotti is an instructor for Centro Hispano de Estudios Teologicos - a Latino Ministry training center in southeast Los Angeles. Rob Johnston is Professor of Theology and Culture at Fuller Theological Seminary. His books include Useless Beauty (Baker, 2005), Finding God in the Movies (Baker, 2004, co-written with Cathy), Reel Spirituality (Baker, 2000) and Life Is Not Work/Work Is Not Life; Simple Reminders for Finding Balance in a 24/7 World (Wildcat Canyon, 2001). Their reviews can also be seen in The Covenant Companion.